Back To The Greenway (279/365 v2.0) – Annoyingly Boring? Back on Day 199 of my this, my second, year of Project 365 I posted a photo of the Hanover Greenway. Well, I finally went back Saturday afternoon as I really hadn’t shot any thing for my Creative Photography Projects workshop on Sunday and I needed something. 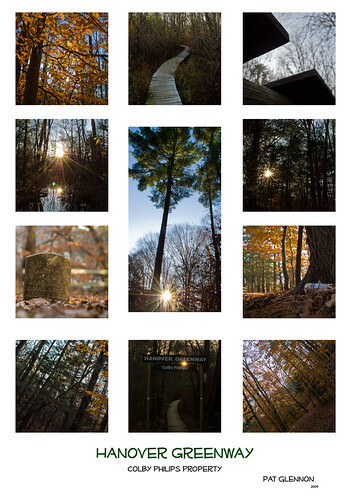 I walked for about an hour and a half in the woods and took almost 300 photos. I got home and was very much blah about them all. I didn’t like them. Rubbish I thought. Nonetheless I went through and picked about 20 to bring to the workshop to share and receive feedback on. They went over better than I would have expected. One piece of feedback the leader gave me was to see what a square image would do for the shots (I had cropped most to 8×10, for no real reason). Well I came home last night and did just that and created a poster of the photos also. Over the course of about 24 hours I went from feeling I had wasted my time in the woods to thinking that if money was no object I’d run out and get them all individually framed and hang them as show on the poster. I’m fickle like that I guess. The whole set of what I had shared with the workshop is on my Flickr stream. .-= Susan´s last blog ..Day 245 =-. Beautiful, I love the look of the poster style too. Nice – I don’t know how you sorted through 300! I’m a fan. The bottom left and right really draw you into it. Nice job! .-= Ed´s last blog ..The Flu Strikes Random (As Does this Post) =-.